These are for spearing birds.... They say they would spear them when they had no shotguns. They used them when there were many of those king eider ducks flying in a big flock. This bird dart has a long barbed point as well as side prongs designed to ensnare flying or floating ducks by the neck or wing. The weapon could be thrown directly at a target or side-armed to skip it across the waves. When launched into a flock, it could take several birds at one time. John Phillip, Sr.: Ukut-wa wani-w’ nuusaarpagnek waten ayuqellriit pilallrukait. Tauna taugaam atauciq cingilek waten pingqeqsaitukut wangkuta. Wangkuta ukut wantetuut. Joan Hamilton: The ones we have in our museum have these [three prongs] up in front [of shaft]. Neva Rivers: Three of them pingayuuluteng apernaqluteng nuyaarpagneng ukut wanesskata. (There are three of them [prongs], and they call it a nuyaarpak [harpoon with three points] if these [prongs] are here [top of shaft]. John Phillip, Sr.: Makut maa-i yaqulegcuutnguut yaanellkuni man’a. Joan Hamilton: And you can get quite a few from that. John Phillip, Sr.: Taugaam wii umyuarteqlemni wani-w’ yaqulegnun man’a aturyugngauq. Ingumun yuurtengremi uum wani, maaggun malkeluku teguyugngaluku. Wiinga waten tuaten man’a recognize-araaqa, piit aturyugngalukuk tuaten. Neva Rivers: Narulkaquluki tengmianeng. Pagagguilriit ukut-ggun-ll’ pitaqsuumaluki. Qantullruata unaken narulkaquuluki tengmiarcuutaitellruamteni. Tengmianun pagaavet pissuutet pianka amllerrluteng imkut Eider ducks-at, King Eider ducks-at, tengautuut in a big flock. Akaurtelall naparyaarmiut pingqellruut piculimeng pingqellruut Apruyulimeng nukalpiangqellruut-gguq taum tamakucim. John Phillip, Sr.: Wani atengqertut man’a epu. Makut epuat ukut pissurcuutet. Ukut-wa cului. Ukut wani cului uyalgem piklinia. (This part here is called an epu [shaft]. These are shafts for these hunting tools. Neva Rivers: Atkulituut tamakut uyalget arnanun. Assiqapiggluteng tang . . . qevlerpak. John Phillip, Sr.: Man’a ayagcuutengqertuq. John Phillip, Sr.: We looked at it [E340223] yesterday, that one with the handle on it. Neva Rivers: This way [overhand straight out from the shoulder] with the thrower. John Phillip, Sr.: Nagiquyam pianek aturyugngauq man’a. Neva Rivers: They have a certain kind of thing [spear] with a thrower that they are able to use with that [point at shaft tip] and with this [prongs at mid-shaft] when they throw them where they’re flying. They used this for birds, to catch while they’re flying. My papa used to tell us that they had this kind. 1. A nuusaaq is a “bird spear with three points;” the suffix –pak means “big” and a nuusaarpak is a “harpoon with three points” (Jacobson 1984). According to Yup’ik translator Veronica Kaganak, a nuusaarpak usually refers to a “fish spear.” A nuusaarpak is also defined as a “large three-pronged fish or bird spear” (Fienup-Riordan 2005). 2. Nuyaarpak is the word for nuusaarpak in the Hooper Bay-Chevak dialect of Yup’ik. 3. Cului (or culut)—often called fletching in English—are “feather flight stabilizers on arrows and spears” (Fienup-Riordan 2005). 4. 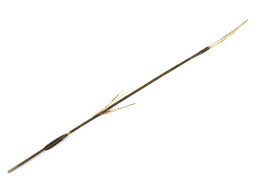 A nuqaq is a “spear-throwing device, atlatl” (Jacobson 1984). It is also called a throwing board, spear thrower or throwing stick. Kayak hunters used bird darts to capture geese and ducks, especially during late summer and early fall when the birds are molting and have temporarily lost the ability to fly. (1) A throwing board was used to achieve greater velocity and distance when hurling the weapon. The barbed prongs of the dart are designed to catch birds by the neck or wing, and if thrown into a flock that was resting on the water might capture two or three at once.